Come winter, summer or rainy season, one needs to take good care of the skin. And, as monsoon season begins, the problems of pimples, rashes and acne increases due to the humid weather condition which makes the skin more greasy leading to dirt accumulates on the skin. Pimples can pop up not only on your face, it can occur in any part of your body. Well, prevention is undoubtedly better than cure. Some simple tips can help prevent or get rid of acnes and pimples easily. Avoid fried food, also glycemic food such as doughnuts, wheat bread, soda and baked potatoes. Removing sugary and starchy products from your diet will help you control acne and keep you healthy in the long run. Physical as well as emotional stress has been proven to trigger skin problems, including premature ageing and acne breakouts in some people. Take a walk or follow a regular fitness regime that will ease away the stress. Stay fit, remain stress free and beautiful. Regular habit of meditation and yoga also helps. Get a skin test done at any leading skin salon or dermatological centre and strictly adhere to the products suitable for your skin type. Always use products that are made for your skin type. Using different skin products tend to clog your skin pores and irritate your skin, and result in pimple or acne breakouts. Sweating keeps your skin cleansed naturally, but needs to be wiped off at regular intervals to prevent skin infections. When you exercise or are out in the hot sun, you tend to perspire a lot. Your perspiration contains all types of toxins and impurities, so make sure you have a towel handy to wipe off the greasy sweat. Wash your face with a gentle cleanser at regular intervals, or least in the morning and before sleep. Splashing fresh water on your facial skin rejuvenates it and the hydration prevents acne and pimples. Make sure you drink a lot of water throughout the day. Water flushes out toxins and other impurities from your system and keeps your skin cleansed and hydrated. It also keeps your skin looking younger and glowing. Try and remain physically active. Yoga and exercises improve your skin tone and boost metabolism. Apart from it, keep walking about or keep yourself busy with manual work such as dusting the house, cleaning your surroundings, gardening, cycling, etc. Wear loose clothing, preferably cotton fabric, that does not irritate your skin. Prevent acne breakouts by avoiding the heat, friction and constant pressure caused by restrictive headgear or other forms of athletic gear. Make sure you shower after exercising to get the sweat and grime off as soon as possible. When you perspire after a vigorous exercise session, there is an accumulation of dead cells on the surface of your skin. 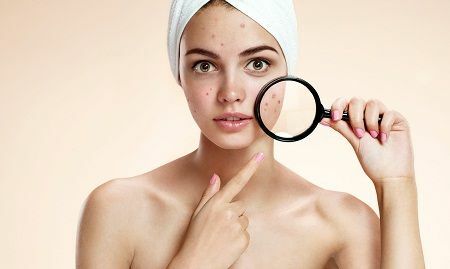 It is essential to remove these immediately to avoid blockages which can then lead to acne breakouts. The best way to get rid of these blockages is to take a refreshing shower after workout. Cleanse your face and moisturise it well. Avoid heavy makeup as it can clog the pores and cause acne or pimples on the face. Use elight foundation or mild cream. Chemicals in cosmetics can cause irritations, rashes and other skin problems. Check the label properly before buying any face product. Stick to minimal makeup till the time all the acne and pimples are gone. Kumkumadi Tailam is the bestever skin care product ever i've tried . Please must try Kumkumadi Products whichis too good for every skin type.